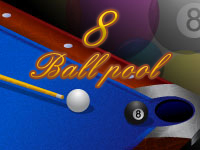 English Pool or "8 ball" is a skill game played on a rectangular table with 6 pockets. The goal is to pocket a group of balls (striped or solid) then pot the black 8 ball. The first player to pocket all balls in a set (spots or stripes), then pocket the black ball is the winner. Place the white ball on the right of the table, behind the white line, click on the white ball with your cue, you can adjust the power and angle to shoot at the triangle of colored balls. You need a minimum of 4 balls to hit the rails or to pot a colored ball for a legal break. If you pot a ball off the break, you may continue to play potting the rest of the balls in the group or you may choose to pot the balls of the other group. If you do not pocket a coloured ball on the break, play passes to your opponent with the option for him to pocket any colored ball he choses. When a player correctly pockets a ball of his group (striped or solid), he may take another shot. Generally the active player must pot one of his own balls, to stay at the table The game is considered won when a player pockets all balls of his group and the black ball. The cueball hitting an opponents ball before one of you own. The cueball hitting the black ball before one of you own. The cueball failing to hit any ball. Pocketing the black ball before all of your own balls. Clicking on the balls located below the table turns the ball numbers face up. When you click on the cue ball, the stick will be pre-positioned on the side where you clicked. In this example, we clicked towards the bottom if the cueball and the cue was positioned in the lower right. With your cue, you can also click on another ball to see if its path to a pocket is blocked. You can add spin ('English') to cue ball. For example, if you want apply backspin, place the blue cursor on the bottom of the cue ball. Prioritise the balls that are against the rails. Always anticipate the end position for the cue ball. Use English to control the cueballs position. Finally, If you have a ball in front of a pocket, it's better to play a different ball, leaving the pocket covered.